Euro Reels Video Slot Guide & Review - Casino Answers! Euro Reels is a 5-reel, 20-line video slot developed by Random Logic, featuring a wild symbol, scatter wins, a free spins feature and a bonus game. You can play the Euro Reels video slot at Bovada. The highest paying symbol in Euro Reels is the Trophy symbol. If you land 5 Trophy symbols on a selected payline, you will win the 15,000 coin top jackpot on Euro Reels. The second highest paying symbol is the Stadium symbol, which can pay up to 2500 coins. The third highest is the Football Boots symbol, which can pay up to 1000 coins for 5 symbols on a selected payline. The Football Team symbol is the wild symbol on Euro Reels. It will substitute for all symbols except for the scatter and bonus symbols. It does not pay out by itself. Use the wild symbol to create new winning combinations on the Euro Reels slot machine at Bovada! Euro Reels’ scatter symbol is the Scattered Football symbol. 3, 4 or 5 Scattered Football symbols will award you with 15 free spins, 30 free spins or 40 free spins respectively. Free spins will play the same number of active paylines and bet per line as the original game. All prizes, including additional free spins (which will be accumulated to the existing one infinitely), can be won during the free spins feature on Euro Reels. If you land 3 Goalkeeper bonus symbols anywhere on the reels, you will trigger the Euro Cash Cup bonus game. 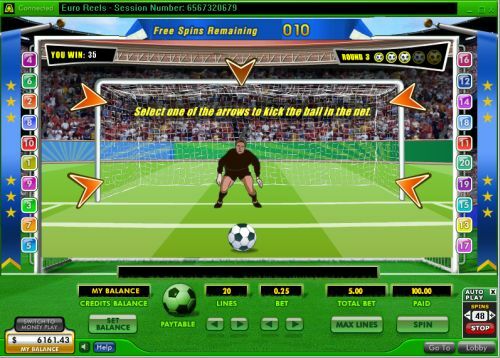 You will have 5 rounds to beat the goalkeeper by kicking the ball in various locations. Once the goalkeeper makes a save, the bonus game will end. Score all 5 shots and you will win the grand prize. It is essentially the same bonus game as you will find on many of the football and soccer slots around. You can win up to 23,000 coins in the Euro Cash Cup bonus game on Euro Reels! All symbols pay left to right on consecutive reels of an active payline, except for scatter and bonus symbols. All wins are multiplied by the bet per line. Scatter and bonus wins are paid in addition to payline wins. Only the highest win is paid on each of the active paylines. The autoplay mode on Euro Reels is located near the bottom-right corner of the screen. Open it up using the arrow. You can type in up to 99 autoplay spins. To begin the autoplay mode, press either “Spin” or “Max Lines.” You can stop the autoplay mode at any time by using the “Stop” button. 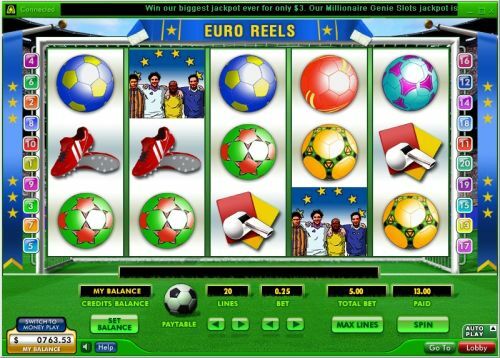 Euro Reels is a great video slot for the football and soccer fans out there. It has a bonus game, a free spins feature and lots of great payouts to offer. You can play the Euro Reels video slot by signing up and making a real money deposit at Bovada! Can I play a free flash game of the Euro Reels online slot? Yes, you can play an Instant Play version of Euro Reels in your browser with no download required at 888 Casino. You can play for free in practice mode or for real money. If you experience any issues with the flash casino, make sure you have the latest release of Adobe Flash Player installed on your computer. Are USA players able to play the Euro Reels slot game for real money? No, American players cannot play the Euro Reels video slot for real money at this time. For a USA-friendly soccer slot, please read our World Cup Soccer Spins CTXM Video Slot Review or play it at Bovada Casino. Where can I read more soccer and other sports-themed slot reviews? For slot reviews of football, soccer, baseball, basketball, racing, horse racing, golf and so much more, you can read our list of online sports slots.